May 8, 2017 By Allyson Leave a Comment This post may contain affiliate links. Read my disclosure policy. 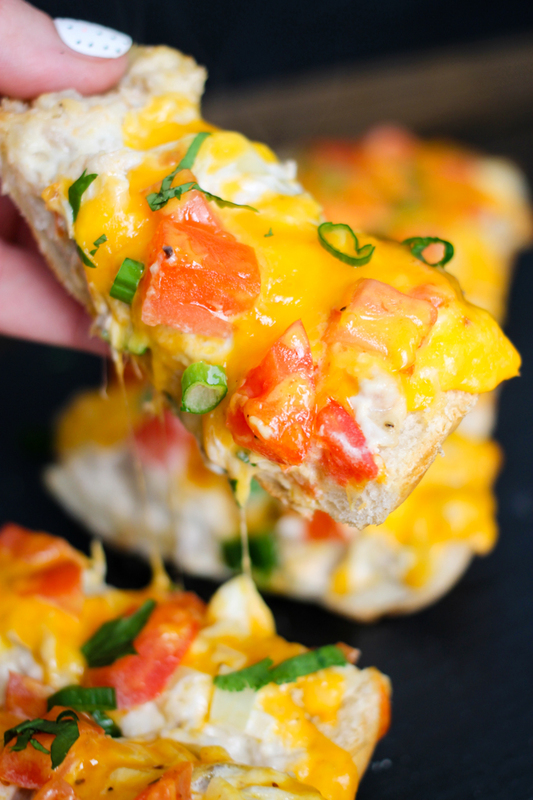 Stuffed Tuna Melt Bread is seriously so easy to make, and totally delicious! I have been whipping this up for a few months now, but finally got around to photographing and making a video of the simple recipe! 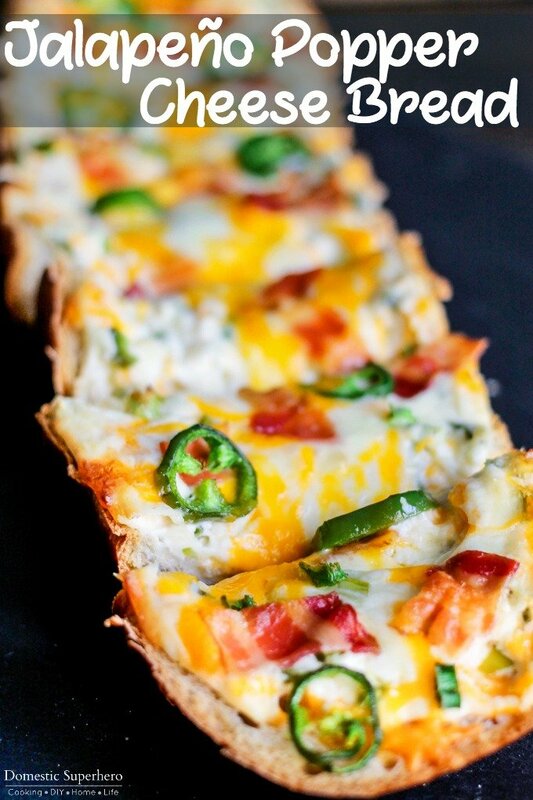 I love how you can whip it up for lunch or dinner, or also make it as a party appetizer. 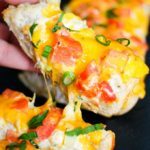 If I am taking this Stuffed Tuna Melt Bread to a potluck or party, then I always wait until the very last minute to bake it. 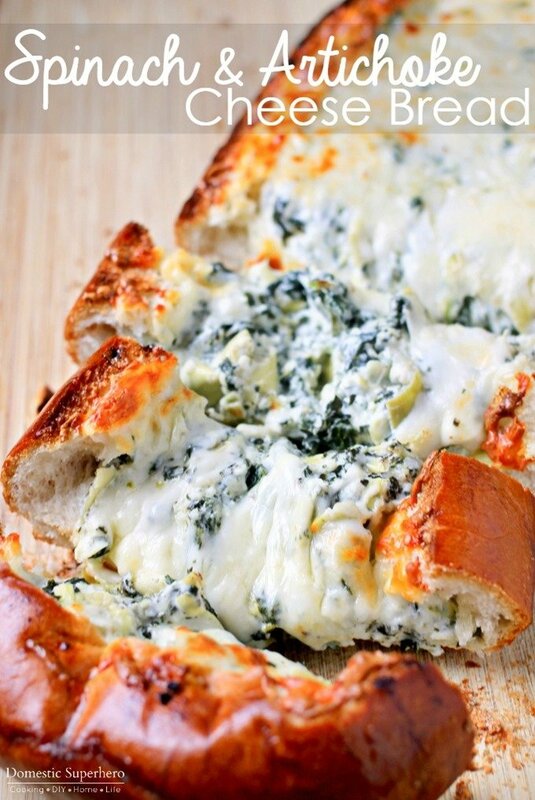 You want to make sure the cheese is hot and melted, and the bread isn’t soggy. You could also not bake it, bring it covered, and then bake at your friend’s home for the 15 minutes it takes to melt…either way, pretty easy! Also, if you like other additions in your tuna, perhaps pickles or celery, go ahead and add those too! 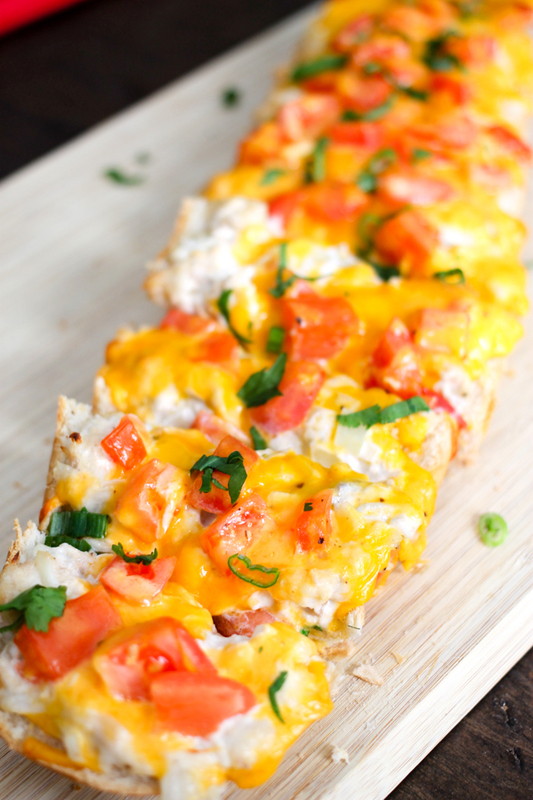 This Stuffed Tuna Melt Bread recipe is very basic and could definitely be jazzed up! My friend made it last week and she added olives and pickles…never tried tuna like that, but hey, it’s worth a shot! 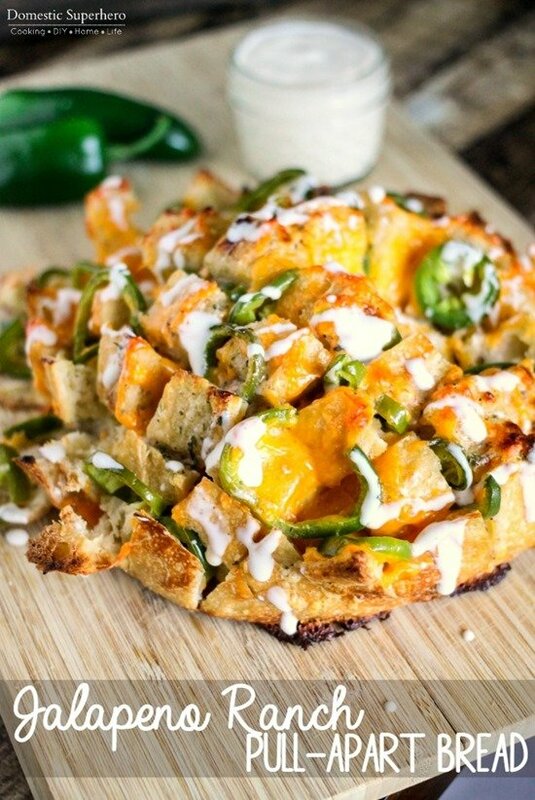 A mixing bowl to combine all the ingredients. A large baking sheet to bake the bread, and then a wooden cutting board to chop the bread. Don’t forget to pickup a Santoku knife for easy chopping of vegetables and the cooked Stuffed Tuna Melt Bread. In a medium bowl combine tuna, mayo, pepper, salt, and onions. Mix well to combine. Lay 1/2 loaf of bread onto baking sheet. 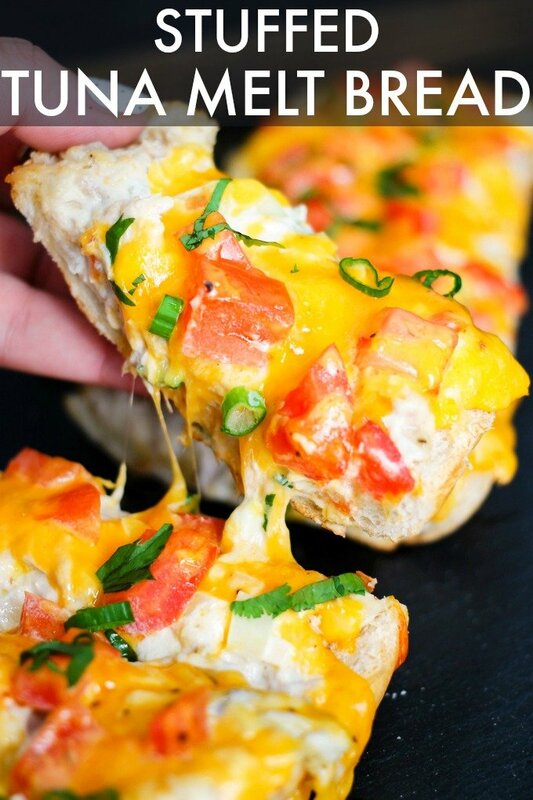 Spread tuna mixture across the top of the bread, then sprinkle with tomatoes and cover with cheese. Add a dash of black pepper over the top. Cover loosely (you don't want it touching the cheese) with aluminum foil and place into the preheated oven. Bake for 10 minutes, remove foil, then switch to broil and broil the bread for 2-5 minutes, watching it VERY carefully so that it doesn't burn. Remove from oven, let cool 5 minutes. Garnish with green onion and parsley if desired. Using a sharp large knife, slice into pieces and serve immediately. If you would like to make 2 loafs of bread, just double the ingredient list. I had an extra long loaf of bread, so you might be able to get 2 halves from the recipe listed above if your loaf isn't as long as the one I used.